Cerebral Palsy is term that encompasses many different disorders that are the result of a brain injury. Learn more about the different types of cerebral palsy. “Cerebral” refers to the part of the brain that is injured and “palsy” refers to disorders of bodily movement. Cerebral Palsy is a non-progressive disorder, which means the effects will not worsen over time, however it is not curable. It is often diagnosed within the first few months of an infant’s life, but can occur at any time as a result of an injury to the brain. About two in every one thousand children born in the United States will suffer a form Cerebral Palsy to a degree. Many times cases of Cerebral Palsy can be attributed to a medical mistake made by a health care provider. Patients with Cerebral Palsy and caretakers should know the average costs due to the disorder over the course of a lifetime can add up to millions of dollars. Do you have a loved one who suffers from Cerebral Palsy? Contact our firm for a consultation now. There are four different types of Cerebral Palsy, classified by the movement restrictions a patient suffers. The most common type of Cerebral Palsy is Spastic Cerebral Palsy, which means the patient is hypertonic (suffers from abnormally high muscle tension). Spastic Cerebral Palsy is broken down into three different types, depending on which part of the body is affected. If one side of the body is affected it is called spastic hemiplegia. If the lower part of the body is affected more so than the upper part this is called spastic diplegia. If the whole body is affected equally, this is called spastic quadriplegia. The second most common type of Cerebral Palsy is Athetoid Cerebral Palsy. Patients with Athetoid Cerebral Palsy suffer from hypertonia and hypotonia, which means they have a mixed muscle tone. Patients can suffer from involuntary and uncontrolled bodily movement. Another type of Cerebral Palsy is called Ataxic Cerebral Palsy. Ataxic Cerebral Palsy means patients may suffer from hypotonia and will most likely have issues with motor skills and balance. The last form of Cerebral Palsy is a mixed form which means the patient will suffer two or more of the pervious types, or even all of them. Often it is Spastic that is found along with another type of Cerebral Palsy. Does your child suffer from Spastic, Athetoid, Ataxic or a mixed form of Cerebral Palsy? Often Cerebral Palsy patients will suffer from other ailments due to the effects of Cerebral Palsy. Secondary conditions can include difficulty eating, difficulty with speech and communication, learning disabilities, mental retardation, hearing or sight impairments, and behavioral issues. Sometimes Cerebral Palsy can be the fault of a health care provider during delivery of an infant. If the infant is left too long in the birth canal, the infant can suffer hypoxia (a lack of oxygen) which can lead to Cerebral Palsy. In certain cases, the umbilical cord can become wrapped around an infants’ neck, cutting off circulation to the brain. Failure to recognize this condition and treat it accordingly can cause Cerebral Palsy. A treating physician’s failure to perform a timely C-section if the infant or mother show signs of distress can lead to Cerebral Palsy. The failure of health care providers to react to a mother’s changing or worsening condition can possibly lead to Cerebral Palsy. If the infant suffers seizures that are not identified or treated after birth, the result may be Cerebral Palsy. If you or your child suffered any of these conditions during the birth of you child, and your child now suffers from Cerebral Palsy, call our Maryland Medical Malpractice Lawyers today for an evaluation. Treatment of Cerebral Palsy is lifelong and very costly over the course of a lifetime. Many different forms of therapy will be required for a Cerebral Palsy patient to life a productive life. Physical therapy will help Cerebral Palsy patients develop their muscles and keep them from becoming tense or floppy from disuse. A physical therapist can help the patient learn skills such as standing, walking, climbing stairs. They can also teach further skills such as running and kicking if the patient is able. Occupational therapy will help Cerebral Palsy patients develop and use their smaller muscles. They will also learn basic skills such as eating and dressing. An occupational therapist will help a Cerebral Palsy patient find the necessary tools or instruments to be used to complete everyday tasks. Speech and Language therapy will help develop the muscles of the mouth and jaw. This will help speech abilities and chewing and eating abilities. A speech therapist can teach other ways to communicate if the patient cannot speak. Therapy is usually extensive for the first few years, possibly tapering off a small amount as the child grows and develops. A parent will also need to work with their child at home to help him reach his maximum potential. The sooner the child enters therapy, the more positive the outcome may be. If your child suffers from Cerebral Palsy, let us review your case. Years of therapy can be costly, and you may be entitled to compensation. Muscle coordination and chronic movements are effected by a condition known as cerebral palsy. These conditions are caused by damage to the brain. Cerebral palsy can affect a child's ability to walk, talk, eat and interact normally with other children. This condition is irreversible. The most obvious defect in a child suffering from cerebral palsy is the child's problems with controlling motor function, especially the muscles of the body. There are many reasons why a newborn could suffer from cerebral palsy. If the child is not delivered timely it could cause lack of oxygen to the brain. Similarly, if a child has untreated seizures after delivery, this could lead to cerebral palsy. During labor it is very important for the physician to make sure the umbilical cord is not wrapped around the neck of the fetus thereby depriving the fetus of oxygen to the brain, otherwise cerebral palsy could result. An unskilled physician who misuses a vacuum extraction procedure can lead to cerebral palsy. Moreover, an unskilled physician's misuse of forceps can cause cerebral palsy. Birth mothers who are in distress during delivery may need an emergency caesarian section. If the physician fails to appreciate this danger, cerebral palsy may result for the newborn. This can happen especially with larger than normal babies. 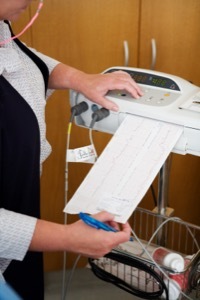 Another important consideration in determining whether a baby might be in danger of suffering from cerebral palsy is changes to the heart rate of the baby. This is something that must be monitored by the attending physician and staff. Even the birth mother's medical condition, such as high blood pressure, toxemia or Rh incompatibility between mother and child can cause cerebral palsy in the newborn. Even conditions such as jaundice or meningitis can cause cerebral palsy. The experienced medical malpractice lawyer can review the medical records of the delivery and look to see if appropriate monitoring of the baby and mother was performed, if appropriate tests were undertaken when necessary, if proper treatment was rendered when required and whether there was adequate care of the baby after birth. Birth trauma and birth injury are particularly difficult in complex medical malpractice cases. Statistics reveal that newborns are more susceptible to asphyxia and require resuscitation more than any other age group. It is extremely important for a physician to appreciate the danger signs and treat this condition immediately. A temporary suspension of breathing can either be what is known as primary or secondary. If it is primary, it will consist of rapid, shallow breathing followed by cessation of all respiratory movement. If respiratory movement stops, the heart rate will fall and fetal blood pressure begins to rise. A quick response to this asphyxia is critical. Even after oxygen is provided to induce respiration, secondary suspension of breathing can result. The onset of this usually involves gasping respirations, a continued decrease in heartrate and low blood pressure. If this occurs, the newborn likely will not respond to stimulation and positive pressure ventilation with oxygen is called for immediately. Failure to monitor the breathing of a newborn and allowing the infant to suffer suspension of breathing can result in significant brain injury to the newborn. Diabetes, hypertension, infection, pre term birth, abnormal presentation of the fetus at delivery, premature labor, early rupture of the membranes, use of narcotics, prolapsed umbilical cord, meconium presence and/or aspiration, placenta previa or abruption are some of the factors that might predispose a newborn to possible breathing issues. Apgar scores offer a way of measuring the amount of asphyxia sometimes. Asphyxia is considered to be one of the most significant causes of cerebral palsy in infants. Asphyxia can cause severe neurological dysfunction. Apgar scores are based upon a test given to the infant directly after birth. The five factors used to measure the baby’s condition are Appearance (skin color), Pulse (heart rate), Grimace response (reflexes), Activity (muscle tone), Respiration (breathing rate and effort). The medical professional will assign a number between 0 and 2 for each of the factors. The highest score possible is a 10. After 5 minutes of birth Apgar scores will be recalculated. 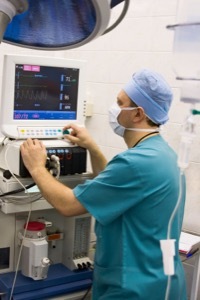 The experienced medical malpractice attorney can review the medical records of the delivery and look to see if appropriate monitoring of the baby and mother was performed, if appropriate tests were undertaken when necessary, if proper treatment was rendered when required and whether there was adequate care of the baby after birth.